This nutritional Fact of the week was a request on my Facebook page. I am always willing to post what my viewers request. I am happy this was requested, because I did not only want to show bad items, I also wanted to show good items. This about as good of a time as any. Yogurt is a good snack food, and if you mix it with fruit and it becomes an even better snack. What kind of flavour of yogurt is your? How do you like your yogurt? What time of the day do you enjoy it? Don’t forget to check out other Nutritional Facts of the week. 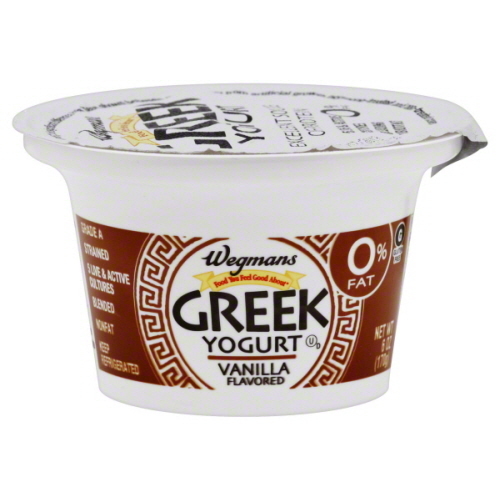 This entry was posted in Nutritional Facts, The Body and tagged Dietary fiber, Dietary Reference Intake, Fat, Greek Yogurt, Nutrition facts label, nutritional fact of the week, Saturated fat, Serving size, Strained yogurt, Trans fat, Wegmans Greek Yogurt, Yogurt. Bookmark the permalink.